This film is about a young man who skates through the city streets looking for scraps of wood. He brings these pieces of wood home and creates an ukulele out of what he found. Most people throw away wood after it is used for whatever task it was needed for, but the potential wood becoming something new and fresh is limitless. In this project, this young man constructed a fully-functional shortbow by Osage orange wood. Through the process, he gets to know that wood carries the memories and cultures of ancestors. A young pyrography artist explores the influence of his grandfather's woodworking legacy while battling the emotional toll of his grandfather's sickness. In this film you will meet with a woodcarver. And this woodcarver is a woman. Here’s her story. After finishing his routine as firewood collector, a boy finds the ideal piece of wood and hopes with excitement to learn the art his family has been practicing for generations. The film is a conversation with Jack who invites us into his simple, honest life roving the rivers of Avon on his narrowboat. He sets up his handmade lathe on the river banks and creates beautiful wooden products, while using no power at all. A story of Jan Pawlikowski, a successful and passionate luthier, who has been working with wood for 57 years. 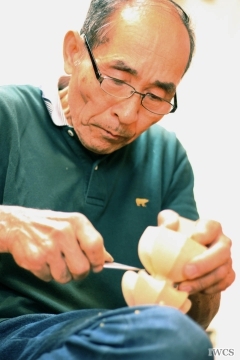 Despite his age he spends days and nights making instruments for customers from all over the world. A child made a wooden puppet and he established a great friendship which was denied from his father. When he grew up, he passed by a shop full of wooden toys and remembered the feeling of being a child. In the end, he reconnected the lost friendship with his little wooden friend. A life spent in woodworking. More than a lifestyle, a way of living. Shot in southern Brazil, this is a film about a father and a son that developed their skills at that same time as they developed themselves working on wood. How can the human being overcome difficulties of life? Here is a humble example: a man who found in art, in particular in the wood sculpting, its relief. Grosotto, this small town is located in the north Italy. There are forests among the mountains, the bond between wood and religion is very strong. In the dim and distant past, men crafted wooden artifacts in order to feel closer to God. The small "wooden" church of the town is a perfect example of this bond. Mary Dunsmore is an avid birdhouse builder and wood-worker. Working with wood for Mary means a lot more than just to build birdhouse. Working with wood is a lifestyle. A story of wooden whales, a seatime cemetery and splintered hands. Sebastià is one of only a handful of old-school carpenters restoring wooden fishing boats, thus bringing a slice of Mediterranean culture back to life. A visual poem from Mallorca. Latvian woodworker Rihards Vidzickis has the love and passion for creating his works by one of the most eco-friendly and beloved materials - wood. Rihards is a talented master, a real fine sculptor and a skillful carpenter, and he is running a park of wooden sculptures and furniture for people to get to know the charm of wood. In this video, it took Rihards monthslong to create a traditional expanded dugout canoe by using mostly traditional hand tools and techniques. The whole process started with stripping the bark from the tree to finally launching the completed canoe, and presented the perfect combination of craft and nature. Woodturning Training program at Wenzhou School of Special Education, set up by the International Wood Culture Society (IWCS) and the American Association of Woodturners (AAW), continued in November, 2015. Mr. Andy Chen from United States, as the instructor of this semester, gave a bowl-turning lesson to Zhu Shicheng and the students at school. The whole staff of Wenzhou School of Special Education expressed their appreciation to IWCS and AAW. Everyone does hope Mr. Zhu could keep on practice and grasp the skill to pay back the society and the students who need more social care. “Wisdom comes as a result of dealing with mistakes,” Willis said. Retired as a pilot from Alaska Airlines, he learned over the years to make the flexible sleds. Building sleds is one thing, he says, maintaining them is a whole different beast. He decided to build the easier to repair and lighter all wood sled. In the fourth century, St. Helena, mother of the Roman Emperor Constantine, went to Jerusalem in search of the holy places of Christ's life. During the excavation, workers found three wooden crosses. Legend has it that the one on which Jesus died was identified when its touch healed a woman. Instead of emphasis on the religion part, this documentary film aspires to showcase the enthusiastic relationship between artists and their wood work, as well as the meaningfulness of our encounters with wood by capturing the celebration at the Monastery of Vosakos and the interaction with local wood carvers. Carlos llerena Aguirre creates large woodcuts for the Biennale of Printmaking for Large Format in Venice. The Venice Printmaking Studio. Venice, Italy. These large woodcuts and others will also be exhibited during 2015 in a solo exhibition at: The Lowe Art Museum, Coral Gables, FL. The Dynamo Art Cocowalk Gallery, Coconut Grove. FL, USA. And the Galería ICPNA Miraflores, Peru in 2016. A portrait of the joys and challenges of working with burl and other native woods, through the eyes and hands of master woodturner and carver Frank White. He takes us through the transformative process, from his sources of inspiration and New England burl in the woods, to working at his lathe and carving bench creating one-of-a-kind natural edge bowls and hollow vessels. Comacchio is surrounded by water—and it has always been surrounded by water until 1821. Before, in order to arrive at Comacchio you had to take a boat. Here wasn’t any material for bricks– it was very rare. So, one of the most used materials that has always been popular, since the times of the ancient Etruscan city of Spina, was wood. In this region there was the ancient forest called "Elisea", which was full of holly oaks, oaks and other types of trees. Over the centuries, the inhabitants of these territories developed techniques to use wood to built boats, lake dwellings and other very special fishing equipment. Dave is a coppice worker, leading and educating his community into more substantial and nature friendly lifestyle. Lumberjack sports seen through the eyes of two hopeful athletes training over the summer to get ready for the Fall season. And their coach, a seasoned woodsman with lifelong ties to the woods. Five-hundred and three guitars on, Jonny Kinkead continues to pursue his craft with a seemingly undulled fervour. A self-taught luthier, his guitars rank amongst the most prestigious currently being produced. During a career that's spanned forty years, Jonny has witnessed the decline and rising cost of quality timbers, meaning a resourceful approach is essential in maintaing his exceptionally high standards. Chad Kaimanu Jackson was born and raised on the Central Coast of California. At a young age, Chad's father taught him the art of surfboard shaping. After spending a few years traveling as a pro surfer, Chad became interested in crafting surfboards out of alternative and sustainable resources. For the last five years he has been hand shaping unique and beautiful surfboards out of agave wood. Chad's passion for the ocean and shaping can be traced back to his Hawaiian lineage. His unique cultural background is also the driving force behind his goals to create low-impact and sustainable wood surfboards that perform at the level of current high-impact and toxic polyurethane foam surfboards. Every day, hundred of teachers in Spain are living around the wood. They join pasion for wood and vocation for teaching. They are joiners teaching the wood to students who not always have the vocation for it. Throughout this path, students learn a trade, to do their best, and they learn too to love the wood and the profession. For teachers, this is also a communal living and learning path, which is marking their life. This is the story of a person who promotes extreme culture in distant Siberia, building skateparks and Snow Parks, mostly from the wood. The video gives a short overview of small kannel, a traditional plucked string instrument of the dulcimer and zither family native to Baltic-Finnic and Baltic people. It is estimated to be at least 2000 years old, some say even 3000. For almost a hundred years, especially in the Soviet time, it was out of favour, but regained its popularity in the last decade. Mart Aardam is the small kannel maker from Saaremaa portrayed in the video, who has made ca 150 small kannels. Okkyum Kim is an award-winning violin maker who believes that he creates new life with each violin, viola, and cello that he makes. How Wood is transformed into Music, one of the highest expressions of Human Soul: the special relationship between a Violinmaker and his Wood. Please meet Kurt Reichmann. He is a hurdy gurdy maker from Frankfurt, Germany. His passion to build this instrument and promoting it have brought him a Federal Cross of Merit and a Musical Instrument Museum which has the largest number of bagpipes and hurdy gurdies. Moreover, he sees himself as a promoter of cultural and musical history. It is very important to him to connect people from different heritage. It was an absolute pleasure to talk to him and be able to get a little impression of what he does and has been doing. Enjoy watching the film! A journey into the future of the diverse uses and realities through which wood marks and bounds, in an enduring naturalness, the existence of man to its own. A stream of images and sounds will try to express in a visual synthesis the concept of “Wood and Humanity”. An optical fiber field engineer living in rural New England finds balance and connection in the old ways of woodworking. He demonstrates how anyone can make a dovetail joint with hand tools, and shares his insights on the role wood plays in our lives. While encouraging us to unplug and truly connect beyond our telephones, he discovers something he never realized before. Musicians, poets, luthiers, sculptors, weavers, artists and other workers of wood philosophize on the affinities between trees and humans. Archtop guitar builder Dale Unger explains why wood is so important to the making of fine instruments. The world contains a tremendously unique assortment of woodworkers. Every one has a special beginning, new styles, and a different approach to the art. What they share is a love for wood. Rather it be a way to make friends, express creativity, or touch someone else's heart, wood can open the door to new beginnings. justyna and matas are on a quest to make the perfect toy for children. something that bridges the gap between traditional wooden toys and new technology. Artist Rita Dee of Bennington, VT uses driftwood to translate her love of horses into larger than life sculptures. This film highlights driftwood as a natural medium that captures movement and grace and elevates human experience. David is a man who has spent his entire life working with wood. This might seem like nothing out of the ordinary, but when we take into account that he lives without a phone, mains electrical power and the only way to contact him is by pining a note to a gate; things become far more interesting. His living accommodation, based in Cornwall, England, is a compound made up of various shacks which he has built with his own bare hands. His wood carvings represent years of intense study of the material, and the personality each piece holds when it eventually arrives at his feet. This is a short story of a man who physically lives through his art, all year long. His disconnection from the modern world shows an unmatched dedication and he represents a dying breed. Meet, The Woodman! Steven Lane is a woodworking artist, from New Zealand, with a unique approach to gathering the materials needed for his work. This story shows how a tree is turned into a musical instrument through the will of Miran Katar, a guitar maker. He had an emotional connection with trees since he was a child and continues to treat wood with respect when building his instruments. In order to understand the wood, he listened to trees. Their whispers. He developed a language only he and the wood understood, a language of music - idioglossia. Jimmy Smith grew up in a small town located in the middle of New Jersey's great Pine Barrens. His Father's love for nature led him down a path of woodworking that grew into a business he started and now runs with his brother. This is an incredible story of a young man called Akili, a Chukudu builder .The Chukudu is a two-wheeled vehicle used in the east of the DR Congo. It is made of wood,and used for transporting freight . Shawo Village is located in Hebei province of China, with about 270 households. Hundreds of years ago, almost every household of the village turned wooden bowls by foot-powered lathe. Besides bowls, they also made other wooden cooking utensils, tool-handles, small toys by other small hand-powered lathe. Today, only six elderly grandpas in the village can use the lathe. The younger generation, led by Li Xuemin who is in deep love and respect to the past, realized the important and responsibility of the inheritance and began to learn the technique from the elders. With the support from various part of the society including the strong support from International Wood Culture Society and AAW, local inheritors are more encouraged and exert themselves to move forward. In the video, you can see the essence of the traditional set-turning technique of Shawo village. The demonstrator is 84-year-old Cheng Jinqing and his apprentice Li Xuemin. Sam Maloof is “America's most renowned contemporary furniture craftsman” and People magazine dubbed him “The Hemingway of Hardwood.” His furniture has become the model for modern furniture designers, and more fans around the world called his hand-made chair “The King of Rocking Chair.” He always calls himself as a “Woodworker.” This documentary exclusively shows the last six months of Sam working on his last three master chairs before he passed away, along with interviews of his successors, longtime friends, and wife. Dan Henny, a craftsman specializing in rustic style aspen and ponderosa pine furniture, shares with us his history and passion of his career. He also talks about the sudden aspen decline, a challenge that he is facing as the growth of aspen trees in the proximity of Colorado is affected by climate change that weakens their resistance against bugs. American Association of Woodturners (AAW) was founded in 1986. Woodturning is separated from other wood working, because the tools are a little different, the technique is different, and the action is different as well. Under Tib Shaw’s guidance, we had a view on a variety of interesting wood crafts by artisans from all over the world. And we also had the opportunity to go through the process of wood turning, which is an incredibly satisfying activity! Ohlone Tribe, a Native American People lived in California coast from San Francisco Bay through Monterey Bay to the lower Salinas Valley in the late 18th century. The Ohlone Indian culture can be explored at the Chitactac-Adams County Heritage Park, which emphasizes a unique view into the Native American culture of Santa Clara area. In Ohlone lives, the baskets that made from willow sticks and sedge roots played an essential role. The Ohlone basket-weaving technique was once lost and later restored by Linda Yamane, who made her first tribal basket in 1994. (*Correction: At 30:27, the name of the International NGO in this video is Ocean Revolution.) A glimpse of Seri’s tribal life and culture in Sonora Desert. This fishing village with brilliant desert ironwood carving technique is unique and can only be found in Sonora desert as a symbolic memory of their daily lives and ancient stories. Nevertheless, with the population number less than 500 and the poor financial condition, Seri people is facing the crisis of preserving their original traditions and language. The IWCS video crew had flew to Ireland and captured the making of this amazing "stone wall," created by collective efforts of international wood artists. This collaborative project is curated by Australian wood turner/artist Terry Martin. Éigse Carlow Arts Festival Come along to VISUAL Centre for Contemporary Art to see this wonderful sculpture!! This exhibition brings together ten of the most intriguing and creative wood artists practicing today from all over the world, alongside ten of Ireland’s leading practitioners. This group of sculptors, furniture makers, carvers and turners will work together under the artistic direction of Terry Martin (AUS). Over a week-long studio-based collaborative work creative week-long process in Carlow this June, they will assemble a large-scale sculpture in the form of a wall, approximately 12 feet in length. This work will be installed in the VISUAL Centre for Contemporary Art. Dongyang Woodcarving, developed in Zhejiang Province, China since Tang Dynasty (618-907), is characterized by its exquisite relief carving. Each piece of work goes through 6 making processes and requires excellent craftsmanship to accomplish the delicate design. Despite its fame, it encounters the problem of shrinking number of new blood and lack of creativity. Alerted to the worrying situation, institutions and individuals have taken steps to reverse the situation and it has been proved to be a successful story of preserving traditional craftsmanship. The Makonde tribe, an African tribe, was regarded as the cradle of woodcarving in East Africa. They live in Tanzania, Mozambique and have a small presence in Kenya. Makonde people are famous for their fanciful woodcrafts, embodying their spiritual beliefs and family life. Let’s take a look of the video! Bagamoyo is a tranquil harbor filled with Islamic fishermen and westerners who come here for vacation in the east coast of Africa. It’s about one hour drive toward north from Dar es Salaam, Tanzania. Fishermen build traditional dhows for fishing and transporting daily goods, such as palm oil and fuel from mainland Africa to nearby islands, for example, Zanzibar. In Bagamoyo, most fishermen still use traditional dhows while only very few of them with better economic status can afford engine boat. A traditional dhow has one or more masts and is usually made of local timber. To sail the dhow, it requires 4-5 people, one operates the oar while the others spread out the sails on the mast. Today, fishing is still the main economic activity along the Bagamoyo coast. Galleon Andalucia is a duplicate merchant ship of 17th century, which has 4 masts and 7 sails. The ship itself tells Spanish history and is currently berthed at Barcelona for the purpose of promoting tourism. There are 22 crew members on board taking charge of daily maintenance. For safety concern, the way of constructing the galleon combines modern and ancient methods. The material, for instance, is a mixture of wood and fiber glass which is safer and easier for maintenance. The wood species used to build the galleon are pine and iroko, which are exactly the same materials used in the old days. The construction of Galleon Andalucia started in December 2008, and finished in February 2010. Experts in different professions such as carpenters, fiber engineers and designers, had assembled in the south of Spain to collaborate on the project. Mines View, also Mines view park, is where visitors can not only see the breathtaking mountainous landscape, but a spectacular view of copper and gold mines of the early 20th century. Mines View Park is one of the most popular/visited parks in the Benguet. There are many woodcraft souvenir shops in the surrounding area, where tourist can purchase unique aboriginal woodcrafts made by local carvers. If lucky enough, tourists may also have the chance to see Ifugao teenager dress in their traditional costumes, and play traditional wooden drums to attract tourists’attention. Carey Island, located 3hours of drive away at the southwest of Kuala Lumpur, is home to the native Mah Meri tribes, who are known for their magnificent wooden craft and masks. The Mah Meri model the masks after the ancestral spirits,who they believe can ward off evil spirits and solve problems. Samri Abdul Rahman, a renowned artist of traditional Mah Meri tribe wooden mask-making, shares with the world the mystic cultural significance of the Mah Meri woodenmasks. Through a demonstration of mask-designing and carving, Samri also shows how he blends in imagination and tradition believes into his profession.